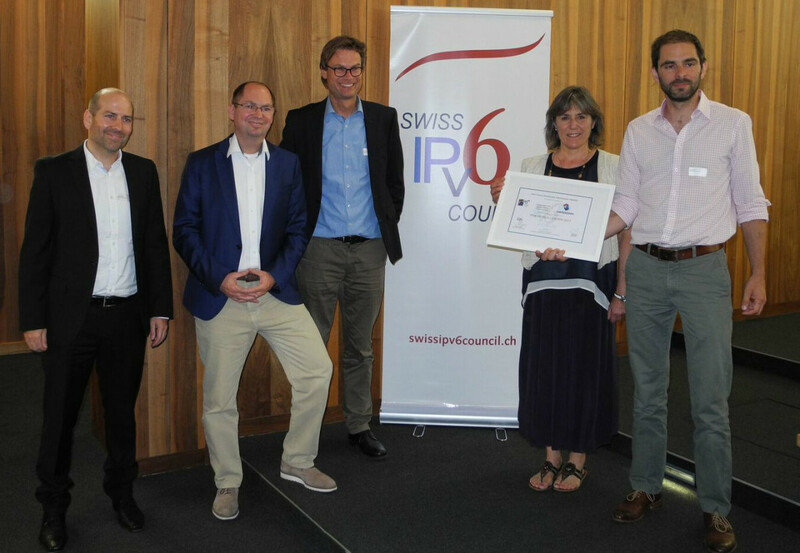 Zurich, 29 May 2017 - On the occasion of the Swiss Internet Conference on 29 May 2017 at ETH Zurich, Swisscom received the Jim Bound Award 2017 from the International IPv6 Forum. The internet provider is distinguished for its outstanding merits in the introduction of IPv6 in Switzerland and worldwide. With around 30% IPv6 users, Switzerland is at the forefront of the spread of the new internet standard IPv6. However, the development of this future-oriented internet infrastructure lasted almost exactly 30 years. At the Swiss Internet Conference, hosted by the Swiss IPv6 Council, the founding fathers Bernhard Plattner and Hannes Lubich looked back on the birthdays of the Swiss internet on 20 May 1987. At that time, they registered the .ch domain with Jon Postel, the great internet pioneer, then director of the IANA (Internet Assigned Numbers Authority). 10 years later, in 1997, they organized the first IPv6 course at the ETH. The shortage of the IPv4 addresses was already clear at this time. There followed a few years of the low percentages of IPv6. The participation of Swisscom in the World Launch Day on 6 June 2012 led to the introduction of IPv6 for Swisscom private customers in 2013 and triggered worldwide astonishment when Switzerland was the first country in the world to achieve a double-digit percentage of 10% of IPv6 users, as Silvia Hagen, President of the Swiss IPv6 Council and host of the Swiss Internet Conference, noted in her presentation on the status quo of the IPv6 distribution. Once again Swisscom was responsible for the next clear jump to 20% in mid-2015. Today, Switzerland is ranked 3rd in IPv6 usage worldwide at around 30%. These users today can reach about a quarter of the Top Alexa 1000 websites globally via IPv6. This includes well-known websites such as the Swiss Post, SBB and global CNN.com. Silvia Hagen presented the Jim Bound Award for IPv6 World Leadership to the proud representative of Swisscom, Martin Gysi, on behalf of Latif Ladid, President of the International IPv6 Forum, for these pioneering acts. The deployment of Swisscom for IPv6 is an important basis for the future viability of the Swiss Internet. Without IPv6 no Internet of Things. With his presentation on this Internet of 100 billion things, the latest speaker Robin Guldener, founder and CEO of Avrios, emphasizes the importance of this basis for the innovative power of Swiss startups in his final presentation "The Future of the Internet". Despite, because of and thanks to IoT, he is convinced that people are at the center of the new Internet - a conciliatory man-machine future for an IoT company founder.